Italian archaeologists say they have found the long-lost underground grotto where ancient Romans believed a female wolf suckled the city's twin founders. The cave believed to be the Lupercal was found near the ruins of Emperor Augustus' palace on the Palatine hill. The 8m (26ft) high cave decorated with shells, mosaics and marble was found during restoration work on the palace. 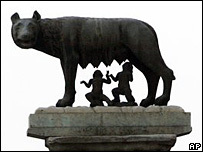 According to mythology Romulus and Remus were nursed by a she-wolf after being left on the River Tiber's banks. The twin sons of the god Mars and priestess Rhea Silvia are said to have later founded Rome on the Palatine in 753 BC. The brothers ended up fighting over who should be in charge of the city, a power struggle which ended only after Romulus killed his brother. In Roman times a popular festival called the Lupercalia was held annually on 15 February. Young nobles called Luperci, taking their name from the place of the wolf (lupa), ran from the Lupercal around the bounds of the Palatine in what is believed to have been a purification ritual. Naked, except for the skins of goats that had been sacrificed that day, they would strike women they met on the hands with strips of sacrificial goatskin to promote fertility. Presenting the discovery, Italian Culture Minister Francesco Rutelli said archaeologists were "reasonably certain" that the newly unearthed cave could be the Lupercal. "This could reasonably be the place bearing witness to the myth of Rome, one of the most well-known cities in the world - the legendary cave where the she-wolf suckled Romulus and Remus, saving them from death," he said. "Italy and Rome never cease to astonish the world with continual archaeological and artistic discoveries, and it is incredible to think that we have finally found a mythical site which, by our doing so, has become a real place." The ancient cave was found 16m (52ft) underground in a previously unexplored area during restoration work on the palace of Augustus, the first Roman emperor. Exploration of the cavity was hampered, however, by fears that it might collapse and damage the foundations of the surrounding ruins. Archaeologists therefore used endoscopes and laser scanners to study it, ascertaining that the circular structure was 8m (26ft) high and 7.5m (24ft) in diameter. A camera probe later sent into the cave revealed a ceiling covered in shells, mosaics and coloured marble, with a white eagle at the centre. "You can imagine our amazement - we almost screamed," said Professor Giorgio Croci, the head of the archaeological team working on the restoration of the Palatine, told reporters. "It is clear that Augustus... wanted his residence to be built in a place which was sacred for the city of Rome," he added. The Palatine hill is covered in palaces and other ancient monuments, from the 8th Century BC remains of Rome's first buildings to a mediaeval fortress and Renaissance villas. After being closed for decades due to risk of collapse, parts of the hill will re-open to the public in February after a 12m-euro ($17.7m) restoration programme.